The small samples of scree and obsidian are from New Zealand's volcanic areas on the North Island. I am not sure exactly where the obsidian came from but I know it can be found in the crater although people aren't permitted to collect it there. I have seen samples in the crater. The piece I have and the small sample I've sent were bought at a rock shop. The scree sample is from the crater and is an accidental collection example. When in Rotorua, New Zealand, you can book to go on a tour of the crater. You are driven up to the crater edge by 4WD cars before hiking up along the crater rim then making a steep descent through scree to the bottom of the crater. When I say a quick descent, you follow a steep track over the crater rim then make large strides in the scree. Each step seems to be over a metre in length as you move along.Care has to be taken as it is a long way to roll to the bottom if you fall. On arriving back after the trip, I found many bits of scree had been caught in clothing and boots. They became my collection of scree. A great way to view volcanoes is to use Google Earth. The satellite images can let you look down craters. Here is a link to Google Earth. You would need to download it. 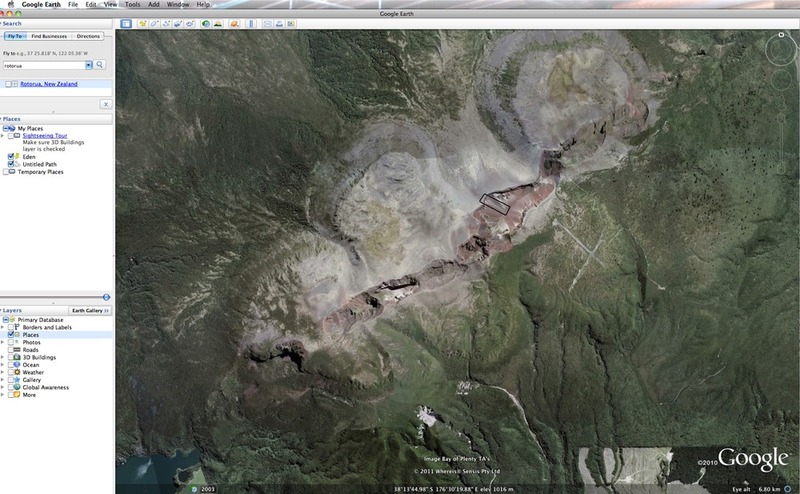 Image 1: A screen capture of Google Earth viewing Mt Tarawera, New Zealand. If you load the full sized image, you can see a rectangle drawn on the screen shot of Mt Tarawera. The rectangle roughly shows you where the next photo shows, inside the crater. Image 2: A photo I took when I was on a tour into the crater of Mt Tarawera. I was standing on the eastern rim of the crater and was looking west. The arrow points to a group of people on the far side. They are about to make their way into the crater. Their size can give you an idea of how large that part of the crater really is. You can make out the track. It's quite an experience. I have organised a few family trips to New Zealand for families in schools where I've taught. The thermal areas and volcanoes are wonderful.When I took this photo, I had some students with me. They were worried the volcano might erupt while we were in it. At that time, the volcano had erupted just over 110 years before. I smiled and said, "It erupts about every 110 years so we're safe.... Wait a minute, it's due now." The boys I was talking to knew me well, "Sure," they said with a smile.